This module will provide lessons on how to create low assistive technology solutions using materials available at hardware stores, electronic stores, and Dollar Trees! This lesson provides instruction on creating a PVC Eye Gaze Frame to assist in communication. This lesson provides information how to create a “mouse house” which enables a computer user to hit a larger target in order to activate the left mouse click. Great to use with the Cause and Effect games listed in our Link Library. 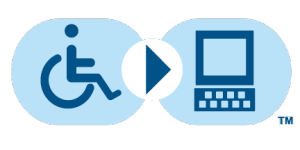 This Word document can be used to create a low-tech flip book to use when communicating with an individual with disability who can say yes (by blinking, raising eyebrow, etc.). Simple and free/low cost ways to make the computer mouse easier to use.